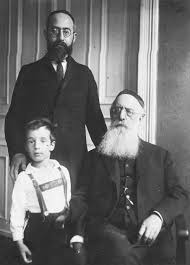 Three generations of Orthodox activists: Nathan Birnbaum, seated; Solomon Birnbaum, standing behind Jacob; Jacob Birnbaum, in white shirt. Solomon (Shloyme) Birnbaum (1891-1989), the eldest of three sons of Nathan Birnbaum and Rosa Korngut, was born in Vienna, lived for a time in Czernowitz (where he acquired his Yiddish fluency), and earned his Ph.D. from the University of Würzburg in 1921 with a dissertation on the Hebrew and Aramaic elements in Yiddish. From 1922 to 1933, he held the world’s first chair in Yiddish at the University of Hamburg. With the rise of Nazism in Germany, he and his family emigrated to Great Britain, where he taught Hebrew and Yiddish at the University of London until his retirement in 1957. Among his other academic accomplishments, he is credited with establishing the authenticity and age of the Dead Sea Scrolls. In 1970, he immigrated to Toronto, Canada, where some of his children and grandchildren still live. Solomon Birnbaum was also the father of Jacob Birnbaum, who, after his emigration to New York in 1963, founded and ran the Student Struggle for Soviet Jewry. Along with his father, Nathan, Solomon became attracted to Orthodoxy around 1911, and became a fully observant Jew over the next decade, involving himself as well in the Agudah (Nathan Birnbaum became the first General Secretary of Agudath Israel in 1919). Solomon’s Orthodoxy manifested itself academically in his exploration of the religious history of Yiddish and in his mission to maintain and revive Yiddish among the Orthodox Jews of Eastern Europe. He also sought to establish an orthography that retained the distinctive features of Hasidic and Galicianer Yiddish, resisting the assimilationist and maskilic features of the modern language (especially in its secularist and YIVO forms). Solomon Birnbaum’s Orthodox Yiddishism found a few supporters in the Agudah, but it had its fullest effects in Bais Yaakov, where the decision was taken in 1929 to drop the Polish supplement to the Bais Yaakov Journal, adopt Birnbaum’s orthography as the basis for the movement’s publications and textbooks, and encourage Yiddish speech at all meetings and events. Birnbaum wrote a number of articles and manifestos for Bais Yaakov publications, and was the guest editor of a special 1931 issue of the Bais Yaakov Journal dedicated to Yiddish–Issue 71-72. More generally, the Birnbaums (Nathan, Solomon, and Solomon’s artist brother Uriel) were figures of fascination and devotion in interwar Bais Yaakov for having “returned” to Orthodox Judaism.